It's amazing what a healthy dose of inspiration can do. 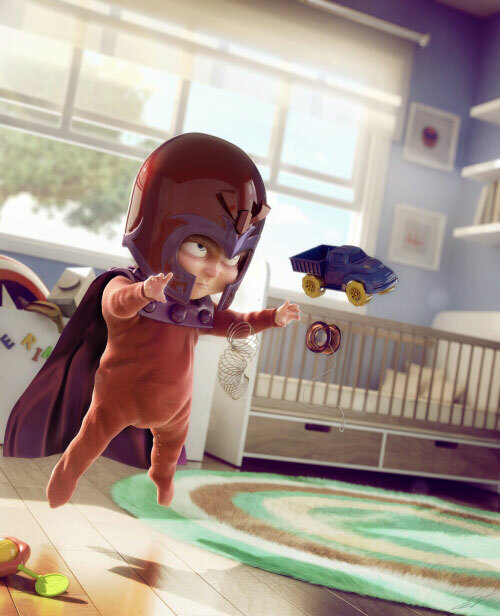 Inspired by the artwork of Skottie Young's X-Babies, 3D Animation artist Victor Hugo took a break from his Street-Fighter based fan work to render this; Baby Erik taking over the nursery, Pixar style. While my mind flips though what X-Baby it wants to see next, Juggernappy or Ororo-ro, someone at Marvel better be putting a few phone calls into place to get this goin' or I'll be throwin' my own toys out of the cot! Except Gizmo - he stays with me. love Scott & Skottie's work. I thought this looked familiar at first glance. Thanks Dene and Craig - glad you both like baby Mags! Better not use safety pins around that baby. There was a time in comics, they turned the X-men in X-babies and Juggernaut too. It had to do with that Mojo world or something like that. Mojo! No wthere's a guy we could see a little more of in comics - Thanks Aliera!